Reflecting back on our #CiaoChazen trip throughout Italy, there are so many experiences and memories that will last a lifetime, but it was definitely the people on the trip that made the biggest impression. As someone who has gone on three Chazen trips, my favorite thing about these trips in general is the ability to meet and make memories with such a diverse group of CBS classmates that I otherwise may not have crossed paths with. This Chazen was no different as more than half were first years who I likely would not have had the opportunity to get to know before graduating without this trip. Additionally, our incredible three Italian leads organized such an amazing itinerary, allowing us to see all sides of Italy through their eyes. They were so good, I decided I must only go on trips organized by Italians from now on as they thought through every minute detail and really enjoy indulging in the nicest of food and wine! This trip was also a once-in-a-lifetime experience to see the inner workings of the many and diverse companies I wrote about in earlier blogs from Ferrari to YOOX Net-A-Porter to Villa Antinori. Each of these companies really showed us Italian hospitality as they were so welcoming and excited for our visits, with some of them like Brunello Cucinelli literally welcoming us into their hometown! These visits made it so clear that personal relationships are very important in business in Italy and are the way lots of things get done. This also makes sense given the importance many of the companies put on their family ownership or heritage like we saw at brands like Ermemegildo Zegna and also Antinori, which is one of the top 10 longest running family companies started in 1385. We will see were the future takes these companies…but I know that the future will definitely take me back to Italy for more exploration and gelato after such an amazing trip! Ciao Chazen to our final visits! Impressive is the only way to explain the final visits of our Ciao Chazen trip at Villa Antinori, Gucci, and Brunello Cucinelli. These three brands all exemplify the true craftsmanship and attention to detailed design that we associate with luxury, however, they all do so in a way that is true to their own heritage. Antinori is one the top 10 oldest family run companies in the world as it started wine production in 1385. Aside from making some of the best wine we tasted all trip, Villa Antinori is a luxury masterpiece with the vineyards, winery and facilities all designed by 50 top architects. Even though the current Antinori CEO said that the capex investment of this facility may not be justifiable, it is clear that it will solidify the legacy of the family brand into generations and likely centuries to come. At Gucci we learned about their remarkable turnaround since 2015 that saw 21% growth in the 4th quarter of 2016 when you have the right combination of business and creative leadership. We heard from the CFO who talked about the current Gucci turnaround starting in 2015 when the new CEO Marco Bizzarri took a risk promoting a current Gucci handbag designer Alessandro Michele to the coveted role of Creative Director ahead of many high profile designers to transition the brand back to its bold fashion-led heritage. Additionally, we were able to see the entire production process from a foot 3D printing mold to the finishing laces of a custom Gucci shoe. The complexities of the technology and craftsmanship were truly inspiring and explain why these shoes continue to fetch the prices they do. The Brunello Cucinelli visit took place in the beautiful medieval town of Solomeo. Brunello Cucinelli started his company in this region of Umbria and has continued to return company profits into the development and restoration of this town. As a man of humble beginnings, he has built his company around a mission of “humanistic” capitalism where profits can be sought without damaging mankind. They have really put their money where their mouth is as they pay their employees 20% more than the industry average, have strict working hours to ensure work-life balance, and reinvest a significant portion of the profits back into the town with theaters and one of the best restaurants we ate at all week as a “company cafeteria”! Though all three are all luxury retail companies, the unique heritage and story of each of these companies has led to truly distinct cultures and business models — and I can’t wait to watch as their future unfolds! Retail isn’t only defined by big brand name luxury fashion shows – but much broader and made of many types of people and industries. 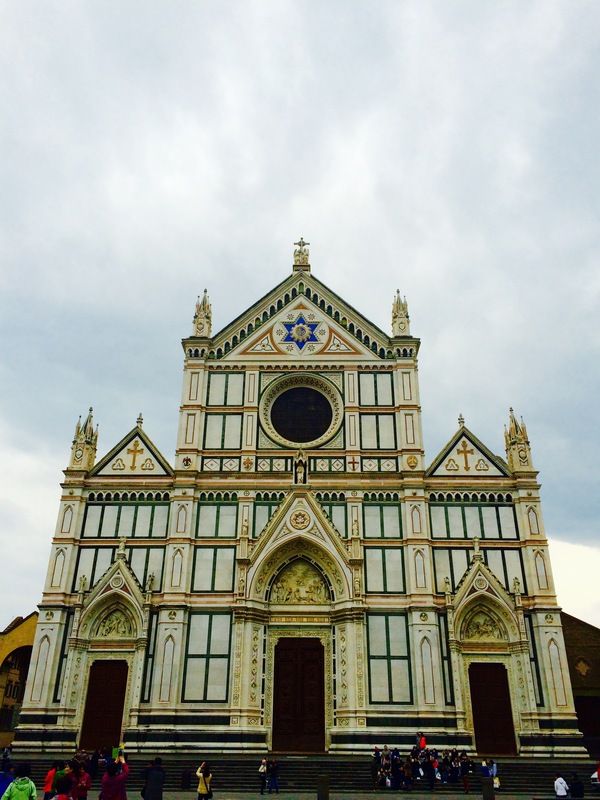 And this trip shows just that – the diverse types of luxury retail from an Italian perspective and heritage. During our first three days, we have seen the retail industry from four different angles. At the first company, Ermenegildo Zegna, we heard from a member of the Zegna family and the head of Customer Relations Management. At Zegna we learned how a traditional craftsmanship brand with deep heritage is shifting from a product focus to become truly customer centric and maintain competitive in the new world of retail. Then we met with the co-founder and CEO of The Blonde Salad, a lifestyle brand that started as a fashion blog with Chiara Ferragni in 2009. Since then they have lived by their moto “differentiate or die” to successfully navigate new waves in technology and social media while expanding into the largest fashion blog, a unique accessories brand, and multi-talent management company. The following day, we visited the hometown of Ferrari in Maranello, Italy which aside from being heaven on earth for the car lovers in our group showed a different type of ultra-exclusivity in product and distribution. Finally, at YOOX NET-A-PORTER, we saw the less glamorous side of retail by visiting their logistics center and “technology temple” in Bologna, Italy. Though supply chain and technology development are not what people typically associate with retail, the two when done well can be a huge differentiator for a retailer. Up next, we have three more visits to see more of traditional retail luxury at Gucci and Brunello Cuchinelli, as well as the other major Italian export of wine at Villa Antinori! It is near impossible to fully explain the difficulty and stress accompanied with packing for this retail Chazen trip to the center of all things fashion in Italy. As a veteran consultant, I have always prided myself on my efficient and minimalist packing. However, the current size and weight of my suitcase as I arrive in Milan says otherwise. By my own doing, I will be lugging that overweight suitcase over the next seven days as our trip takes us to Milan, Maranello, Bologna, Florence, Solomeo, and Rome. In each of these cities and the Italian countryside in between, we will be visiting seven companies that have defined and inspired all types of luxury around the world. From a potential test-drive at Ferrari’s factories to meeting one of the most famous fashion bloggers in the world Chiara Ferragani who’s blog The Blonde Salad just became an official Harvard Business Case Study that future business school students will study for decades. For Italian fashion, we will visit Ermenegildo Zegna, Gucci, Brunello Cucinelli (at their headquarters in their own 14th century castle no less) and massive luxury e-Commerce conglomerate YOOX NET-A-PORTER led by CBS alum Federico Marchetti. No trip to Italy (or business school trip in general) would be complete without indulging in the local food and wine as well. In Tuscany, we will also be visiting Marchesi Antinori, an Italian wine company with a history dating back to 1385. Led by our three fantastic Italian classmates Massimo Allevi, Marco Pucciano, and Riccardo Ruini along with our luxury expert Professor Maisonrouge, our group is sure to have a once in a lifetime trip across Italy full of learning opportunities while also taking time to appreciate the finer things of life – in Italian style of course. I humbly look forward to keeping you updated throughout our adventures – Ciao for now! For the final part of our journey we head to Milan on 19th March. Our hotel was literally a stone’s throw away from the Duomo and the very bustling centre of Milan. The location couldn’t have been more perfect. After relaxing in our hotel for a while, we went for dinner to Trussardi which is a very posh eatery in Milan. Later we head to the Armani Prive Club to check out the local nightlife in Milan. It was quite amazing to see the club buzzing on a Wednesday night. The next morning we head to Ermenegildo Zegna’s corporate headquarters, where we first met with Bain & Company’s retail & luxury good’s practice. We were fortunate to be joined by Claudia D’Arpizio, a partner at Bain, a stalwart in the luxury consulting and author of Bain’s annual luxury report; Fulvio Peppucci, another partner and Roberto Tribioli, a newly minted CBS MBA. The statistics they shared about the luxury industry were eye-opening and given that we were hearing from a renowned subject matter expert, we could be sure the facts were accurate. Next we heard from Benedetta Zegna, (Talent Manager) about the history of Zegna and how the brand under the creative directorship of Steano Pilati had really blossomed and branched into fragrances, cufflinks and eyewear. 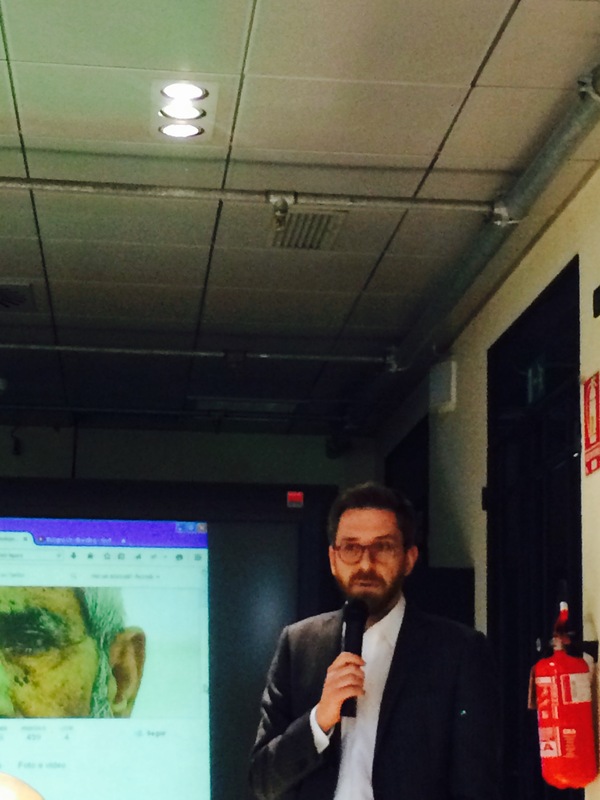 Later Mario Marraccini (Retail, Planning and Buying & CRM director) told us about the Zegna World Pass program – an exclusive invite only loyalty program for top 200 Zegna customers. It was nice to hear how such a traditional brand steeped in heritage was adapting to the modern methods of retail nowadays. 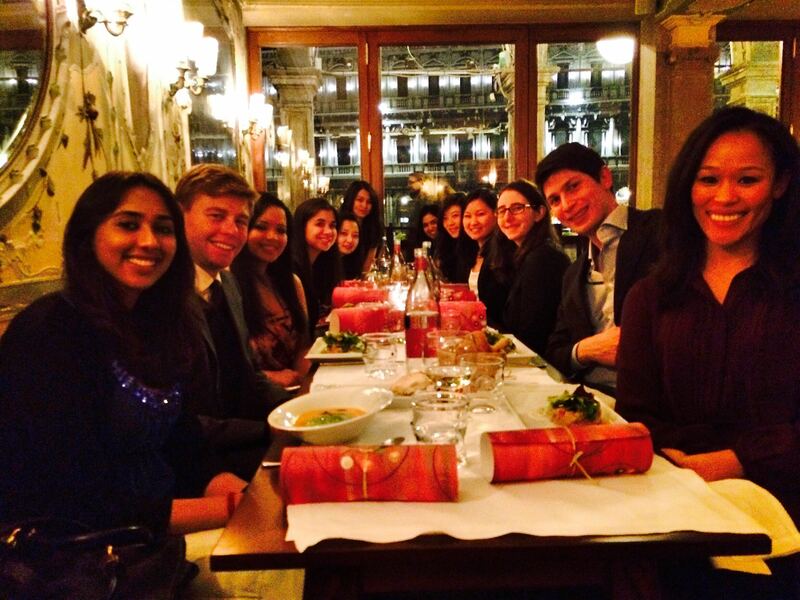 After the company visit, we spent some time sight seeing and later had dinner at La Vecchio Lira followed by another club visit to the Cavalli Club. The following day we visited GROM Gelateria to learn more about their quality Gelato making process. Grom was founded in 2003 by two friends who wanted to produce quality gelato – without any flavorings, color, preservatives or chemicals added of any kind. Grom mixes liquid flavors in its lab at Turin and distributes them to retail stores where they get whipped freshly each day. From now has over 50 stores in Italy and 7 around the world, 3 of which are in New York. After trying flavors like Biscotti, Pear and Pistachio – I definitely want to try the gelato in New York soon. But more than anything I promised myself that I would be back in Italy soon. 1) Beauty: Every city we went to was so beautiful and had some of the most incredible art and architecture I’ve seen. From the rainbow hued houses in Burano to the brilliantly done facade of the doom’s. Unfortunately, since we had visits during the day we were unable to go inside a lot of the museums/cathedrals because they shut by 5-6pm. 4) Fashion: Milan of course is the mecca of fashion and all through out Italy, people are impeccably dressed. In fact we were given dress codes for all our company visits (by our peers, not the companies). 5) Food: The food in general was amazing. I think i’ve had a year’s worth of pasta, pizza and cheese and olive oil! In a lot of restaurants are meals went on for hours… and we always had two main courses (risotto and pasta followed by meat and veggies) which was very unusual. All in all it was a great trip and I highly recommend anyone interested in retail & luxury goods to definitely visit soon! 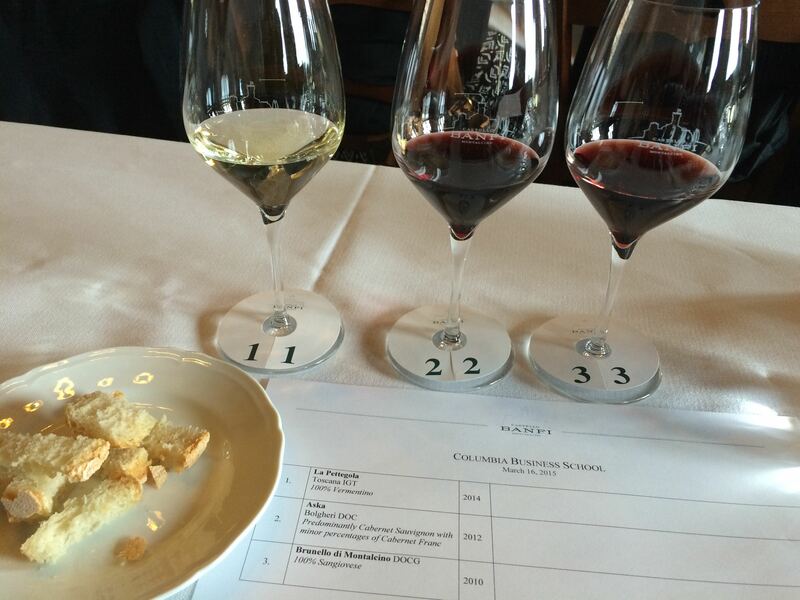 So continuing from my last blog post I wanted to share what we did on days 3, 4 & 5 of Chazen Italy. 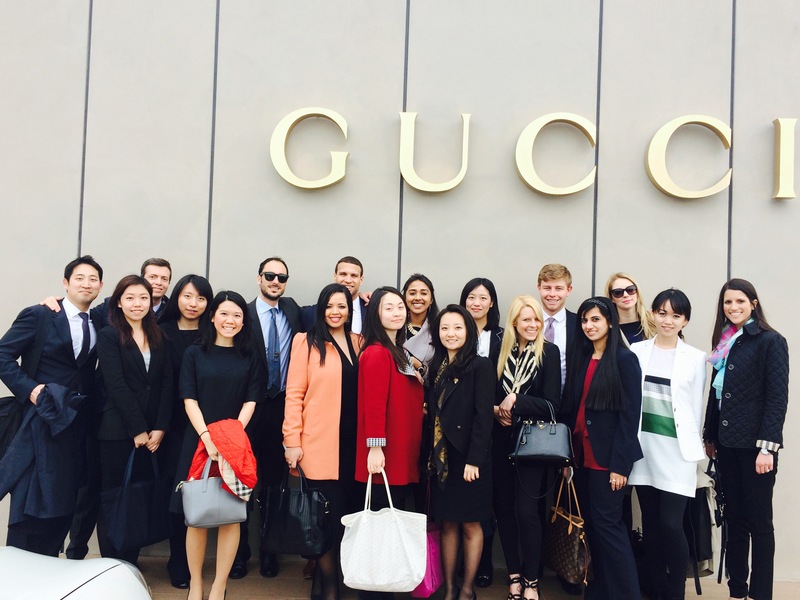 As I’d mentioned previously, this study tour was focused on retail & luxury goods and the next few visits were really the highlight of our trip. On March 17th we visited Gucci’s headquarters in a town close to Florence. Gucci, for those who don’t know is a luxury powerhouse, one of the world’s most valuable brands, belonging to the Kering group with about $5 billion in revenue. Upon entering the premises we were greeted with the GUCCI letters emblazoned in Gold and and everywhere in the office were huge photos of their classic handbags. Our group was split into two with one team going to see shoe production and the other going to see the leather goods factory. I was in the latter group. The first thing we noticed when we entered were dozens of colored skins – ostrich, crocodile, lizard, lamb, calf – you name it. Full skins can cost upwards of $1000 depending on how exotic they are. Most skins will also come with a tag to prove authenticity and we learnt that luxury companies often own their own animals farms to procure skin. The skins are then colored in various hues – almost any conceivable color is possible. I was just speechless looking at them all. 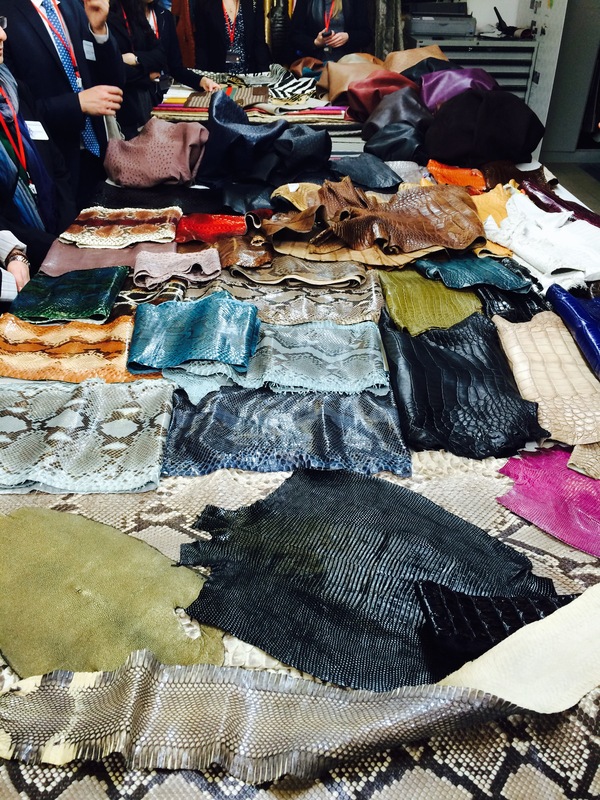 We were then taken shown how these skins are cut and then made into handbags, belts or other leather goods. 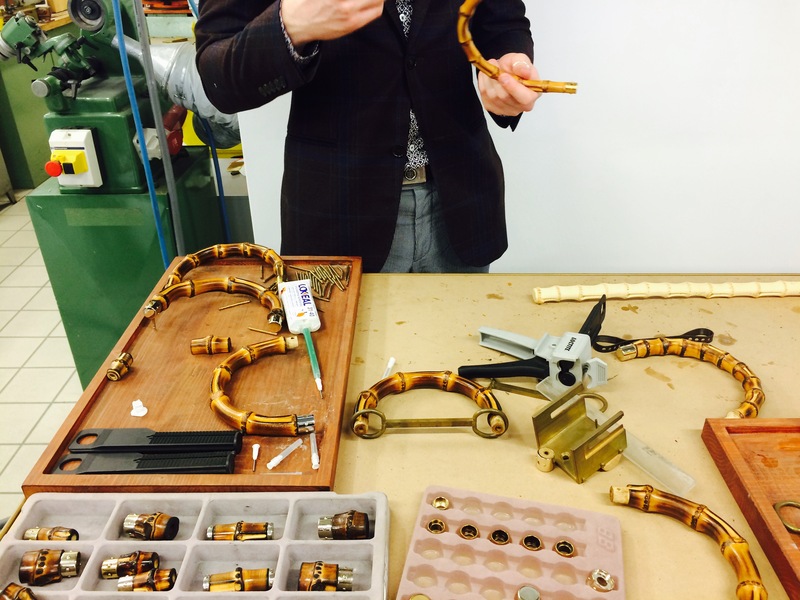 Each of those products in handcrafted. Right from the bamboo handles that Gucci is so famous for. We were shown how the straight white bamboos are blow torched and then painted into becoming horse shoe shaped handles for their handbags. The paint is apparently made by crushing the shells of certain insects like cockroaches! I guess beauty comes at a price! The entire process was just fascinating. Later we were given a presentation by Barbara Rybka, SVP of Digital and we also met with a CBS alum Giorgia Carastro ‘ 11. After a lavish lunch and quick photoshoot, we head to Ferragamo’s office in Florence. Salvatore Ferragamo started off as the shoemaker to the stars and then later expanded into belts, handbags and even clothing. It is a privately held company with sales of $1.5 billion The Ferragamo office was very different to that of Gucci’s. It was a 7 storied ancient building and underneath was a huge flagship store that broke up into multiple sections. 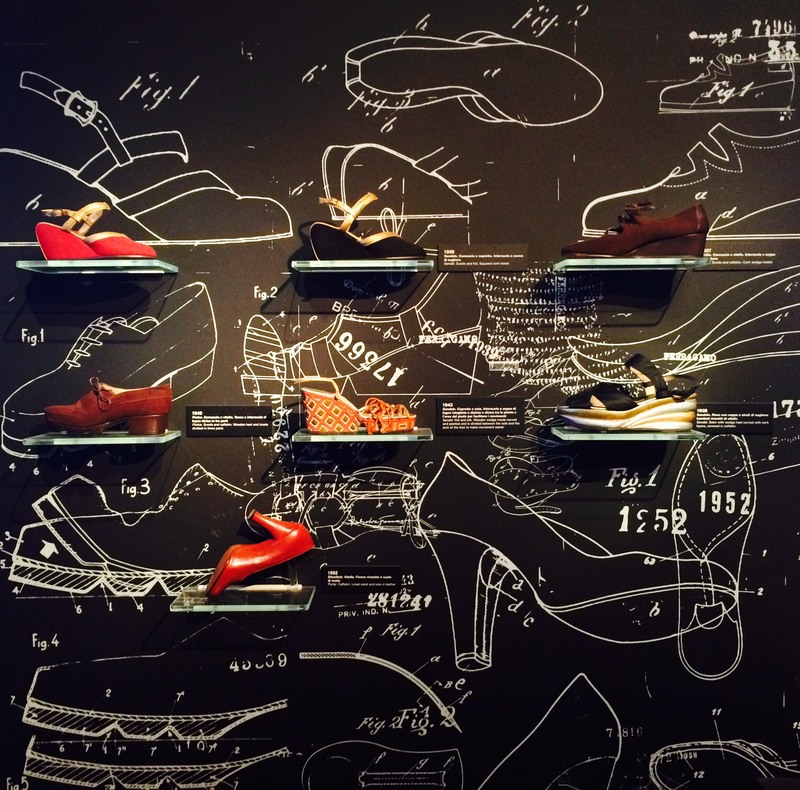 Beneath that was the Ferragamo museum dedicated to shoes – the history, the collections, the inspiration and everything in between. Later we had some free time to ourselves so we visited Piazza Michelangelo, Santa Croce and Santa Maria Novella followed by dinner at La Beppa Fioraia. The next day we made a stopover in Bologna where we met deputy mayor, Matteo Lepore, before heading to Yoox. Yoox Group is the global internet retailer for leading fashion brands and has recently merged with Net-a-porter (this had not been announced when we visited). Yoox was founded in 2000 by CBS alum Federico Marchetti. It ships to over 100 countries worldwide and has revenue of $0.5 billion. We were given a tour of the three different facilities by Davide Di Dario, operations manager for Yoox. Ciao everyone! The 10 days in Italy were absolutely phenomenal and I can’t believe how quickly the trip went by. The study tour was so intense that it left me with no time to blog during my visit but I hope to share in detail how amazing each day was. 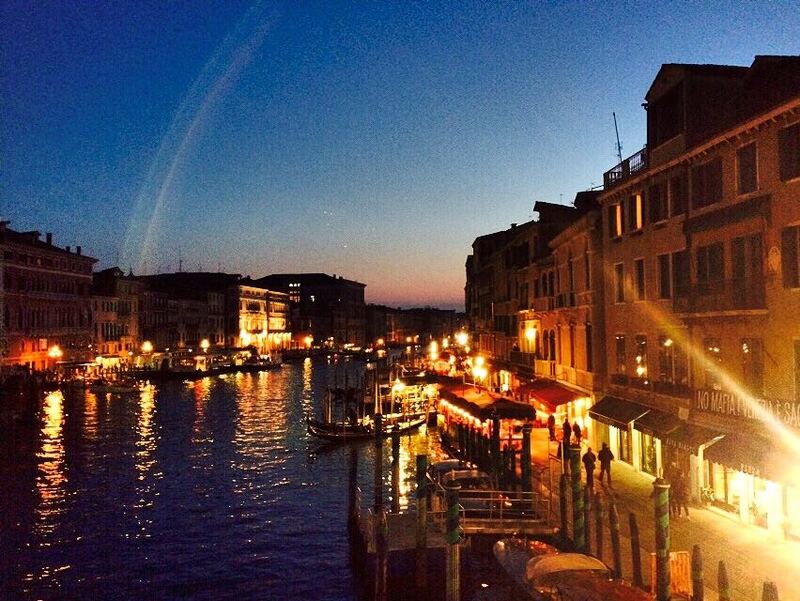 A few chazeners started off the tour with a trip to Venice. As soon as we arrived we were enamored. We walked through all the little alleyways all the way to San Marco square, crossing over bridges, stopping to soak in the beauty and capture those moment forever. We also visited Cafe Florian for some apperitivo and then an indulgent three course meal at ABC quadri where I had some of the best Tiramisu ever! The next day we saw the St. Mark’s Basilica, Dodge’s Palace, Rialto Bridge and also went up the bell tower to get a bird’s eye view of this canal city. Later we visited Murano (glass blowing) and Burano (lace factory) which were a short trip from central Venice. At night we checked out the local bars and restaurants and got a glimpse of the student nightlife there. The next day we left for Rome where are official Chazen trip began. We did a 3 hour tour of Rome and saw St. Paul’s Basilica, the colosseum, the roman wall, the piramis and also learnt about Roman history. It was definitely amusing to learn what the Romans did during theirs leisure time: working out, getting a massage, sitting for a steam sauna in open air pools. As we toured the city, I noticed how the facade of houses/buildings had a characteristic Roman touch. We were told that Rome has very strict rules on houses should look from the outside, so as to maintain the Roman look. 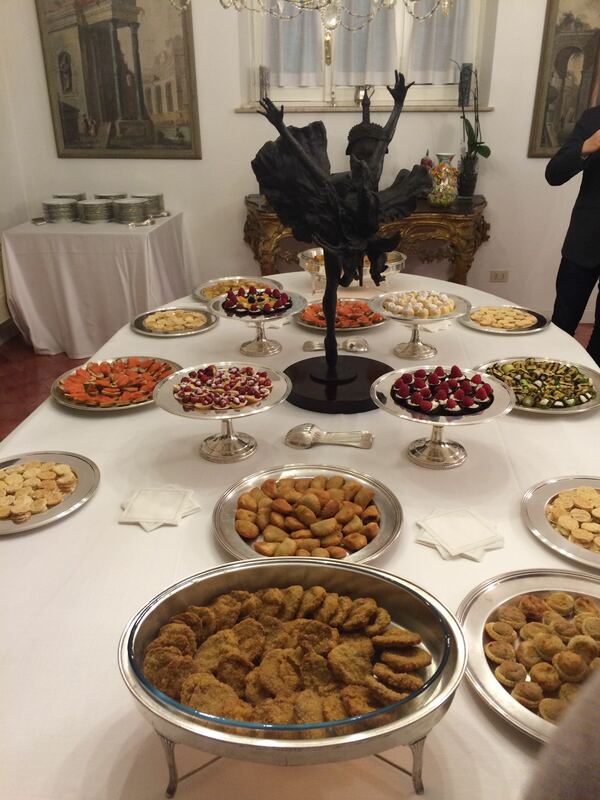 Later that we were hosted President of Rome’s Columbia Business School Alum Association, Imran Tayebali at his Villa where we nibbled on tasty petit fours. The next day we head to Tuscany, one of the world’s most celebrated wine regions, for our first company visit at Castello Banfi. 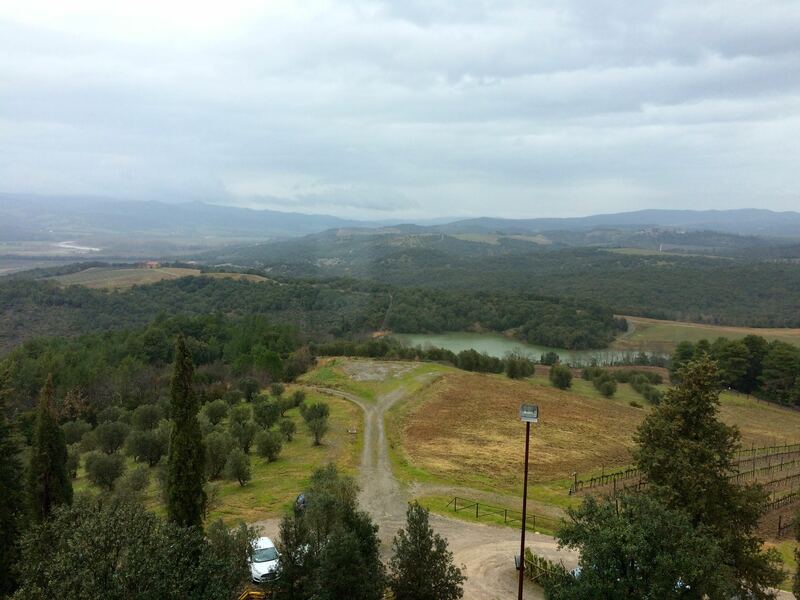 Castello Banfi is a family-owned vineyard estate and winery located in the Montalcino region of Tuscany. This award-winning estate was founded on the philosophy of blending tradition with innovation, and is recognized as a pioneer in elevating the standards of Italian winemaking. Its revenues for FY2013 were almost 70 million Euro, almost half of which was generated in Europe and 40% in North America. It sold 15 millions bottles worldwide last year…and we soon found out how. After a wonderful presentation by Luca Devigili (Brand Manager Banfi Piemonte and Trade Marketing Manager) and Elizabeth Koenig (Estate Hospitality Project Director) we had the opportunity to taste three fantastic wines. We had the Brunello di Montalcino (one of their most premium wines), Aska (a Cabernet Sauvignon with mild percentage of Cabernet Franc) and a recently introduced wine targeted towards first time female drinkers, La Pettegola, which was my favorite. This was followed by the most sumptuous lunch at a restaurant on their vast estate. 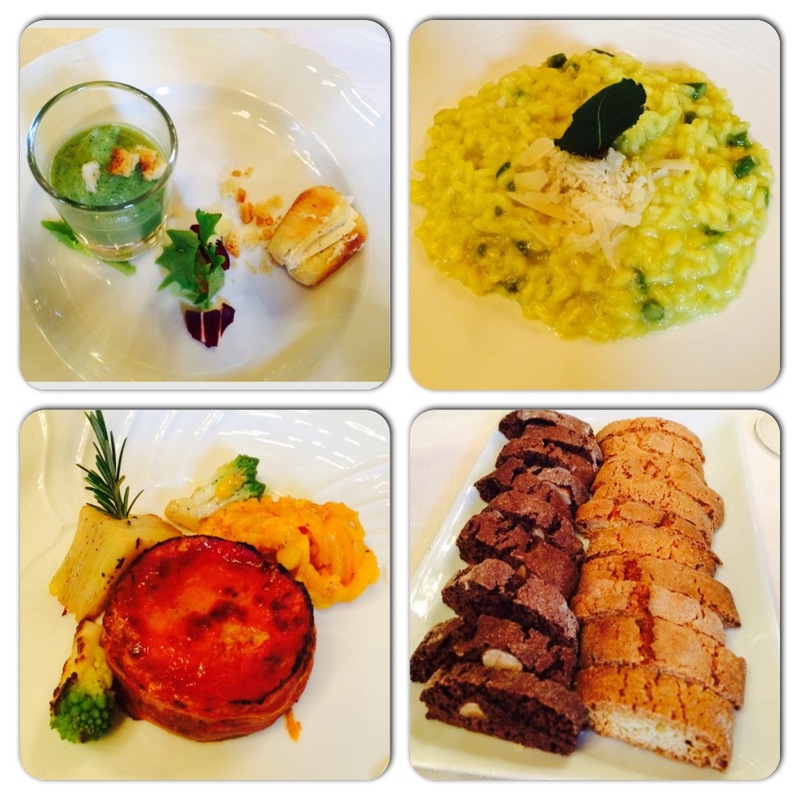 We had asparagus and saffron risotto with fossa-aged pecorino cheese and veal fillet in aromatic herbs crust with potato mille-feuille, with wine pairings of course. A special mention for the delicious olive oil which a few students even purchased and the staff were more than willing to wrap our purchases in the most secure way. As I looked all around the estate, the beauty of untouched nature left me mesmerized and I wish we could have stayed there longer…it really was the perfect start to our trip!